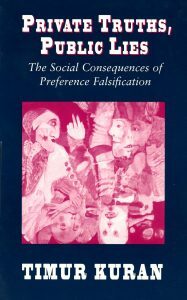 “Why Revolutions are Better Understood than Predicted: The Role of Preference Falsification” [Comment on an article by Nikki Keddie], Contention, 3 (Spring 1992): 199-207. Reprint: Debating Revolutions, ed. Nikki R. Keddie (New York: New York University Press, 1994): 27-35.